The Jugurthine War was a key war in the final century of the Roman Republic. Like the Americans in Iraq, Rome assumed that their war against Jugurtha, King of Numidia (a nation in north Africa), would be a cakewalk. They believed that Numidia was a nation of savages with a bizarre religion. They assumed that their own “shock and awe” attacks by the superior legions would decapitate and destroy the “evil doer” Jugurtha. They believed that in order to liberate the Numidians of their primitive ways, they had to impose the civilized will of the Roman state on this backward nation. Rome never expected that the Numidians would wage an insurgent war against their Roman occupiers. This war ended up dragging on for almost a decade. And in the end, it showed the depravity of the ruling party (the ultra-conservative republican Optimate party), which was sending the Roman Republic on its way to tyranny, empire and ruin. In 148 BC, the King of Numidia, Masinissa, died. The Roman proconsul, Publius Cornelius Scipio Aemilianus, had been given authority by Masinissa to divide Masinissa’s estate. He divided it between Masinissa’s three sons, Micipsa, Gulussa, and Mastarnable. Soon after, Gulussa and Mastarnable died, leaving Micipsa as the sole King of Numidia. Around the year 134 BC, Micipsa sent Jugurtha (who was Masinissa’s grandson, but the son of another Numidian) to Spain with Scipio Aemilianius. Scipio was fighting the Celtiberians, who lived in a part of what is now Spain. Jugurtha was able to raise an army to help Scipio. Because of the valor of Jugurtha and his army at the Siege of Numantia, Scipio was able to win his war against the Celtiberians. While fighting for Rome, Jugurtha worked alongside his future enemy, Gaius Marius. Jugurtha not only learned the superior Roman style of fighting, but he also learned of Rome’s weakness for money and thus bribery. Jugurtha described Rome as “urbem venalem et mature perituram, si emptorem invenerit” (“a city for sale and doomed to quick destruction, if it should ever find a buyer”). When Jugurtha returned to Numidia, Micipsa adopted Jugurtha, and decided to include Jugurtha in his will. In 118, Micipsa died. He left his kingdom to Jugurtha and his two natural sons, Hiempsal and Adherbal. Shortly after Micipsa’s death, Jugurtha had Hiempsal killed. Adherbal fled to Rome. The Roman Senate sent a commission to Numidia to make peace. Jugurtha bribed the Romans on the commission, and thus the commission gave the better regions of the kingdom to Jugurtha. In 113 BC, Jugurtha took his army and cornered Adherbal in his capital city of Citra. 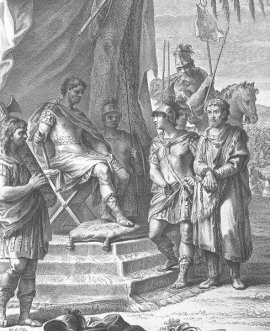 According to Sallust, Adherbal had the support of the people, but Jugurtha had the support of the best soldiers. A Roman Commission was sent to Numidia to forge a new peace. Jugurtha then bribed the Romans on this commission. The Romans thus allowed Jugurtha to storm Citra, and slaughter Adherbal and his supporters. Because Jugurtha slaughtered a number of Italian business people (including Roman Equites, or “Knights“), the Roman senate declared war on Jugurtha. The Roman Senate sent an army under the command of the consul Lucius Calpurnius Bestia to fight Jugurtha. Bestia decisively defeated Jugurtha. But Jugurtha bribed Bestia, and thus was given unusually favorable terms. The Roman Senate viewed the favorable terms with suspicion, so it summoned Jugurtha to Rome. When Jugurtha arrived in Rome, he bribed two Tribunes, who thus prevented him from testifying. While in Rome, Jugurtha attempted to have his cousin and rival Massiva assassinated. Because of this, he was expelled from the city and returned to Numidia. In 110 BC, the Roman Senate sent the praetor Aulus Postumus Albinus (who was the cousin of a consul for that year) to defeat Jugurtha. Because Jugurtha bribed key Romans involved in Albinus’ army (who then betrayed Albinus), Albinus was defeated. The Roman Senate then sent the consul Quintus Caecilius Metellus to fight Jugurtha. At the Battle of the Muthul, a young Roman officer named Gaius Marius helped to reorganize Metellus’ legions, which then defeated Jugurtha. But Jugurtha was defeated because he forced his army to retreat before it could suffer heavy losses. The Romans did suffer their own heavy losses. Jugurtha disbanded his army, and had his soliders mount an insurgency to fight the Roman occupiers. Marius returned to Rome. Dissatisfied with the slow pace of the war under Metellus, the Roman Military Assembly (one of the two Roman legislative assemblies, similar to the US Senate) appointed Marius consul (the Military Assembly, not the senate, appointed consuls). The Roman consuls had similar powers as the US President. The consulship was the highest constitutional office, and the consuls had imperium powers, which allowed them to command armies and conduct wars. The senate didn’t want Marius to be consul, because at this time it was dominated by an ultra-conservative republican party of aristocratic elites known as the Optimates. Marius belonged to the party that opposed the Optimates, the Populares. Partly because the senate didn’t like Marius, and partly because of the increasing difficulty Rome was having in recruiting armies, Marius was forced to raise his own army. The capture of Jugurtha, from this French history of the Jugurthine War. Marius took his army to Numidia to fight Jugurtha. But while Marius had been raising his army, Jugurtha allied with his father-in-law, Bocchus, the King of Mauretania. Marius defeated Jugurtha and Bocchus in several key battles. But much like with the American occupation in Iraq, Jugurtha’s strategy of insurgency warfare against the occupiers rendered all conventional victories irrelevant. Marius was playing a game of whack-a-mole. No matter how many times the Numidians were defeated, Jugurtha’s insurgents would regroup and keep fighting. It became clear that because of this, Rome could not defeat Jugurtha. Marius sent his young Quaestor, Lucius Cornelius Sulla, to Bocchus. Sulla bribed Bocchus, and told him that Bocchus would be given a part of Numidia if he would betray Jugurtha. Bocchus then decided to give Jugurtha to Sulla. Sulla took Jugurtha to Rome, where Jugurtha was strangled in the Tullianum in Rome after marching in Marius’ January 1, 104 B.C. Triumph. 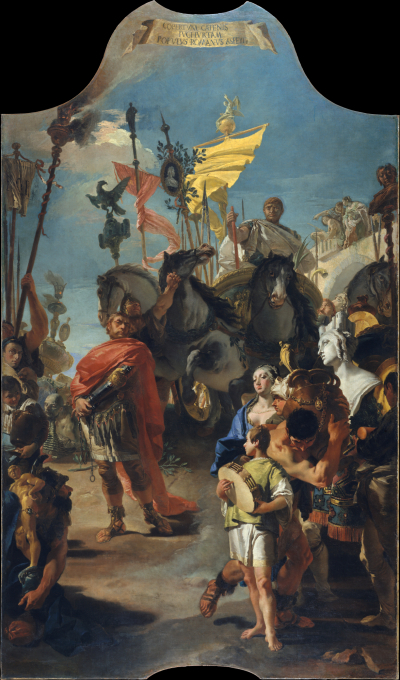 The Triumph of Marius (1729) by Giovanni Battista Tiepolo. The inscription in Latin reads “The Roman people behold Jugurtha laden with chains”. The Jugurthine War was over. But in the process, several problems were exposed that would cause Rome serious pain in the future. Republicans in this country love to tell us that money in politics is harmless free speech. But as we saw in the Roman Republic during the Jugurthine War, money can be very corrupting. Rome almost lost the war because of money in politics, and the susceptibility of public officials to bribery. In addition, this war saw the rise of two Romans who would play a key role in the events that directly preceded the fall of the Roman Republic. The first Roman made famous through this war was Gaius Marius. Gaius Marius would later hold the Roman Consulship an unconstitutional 7 times in 21 years (constitutionally, a Roman had to wait 10 years before being reelected consul). The second Roman made famous through this war was Lucius Cornelius Sulla. Sulla and Marius would fight an unconstitutional civil war with each other several years after this war had ended. Sulla would illegally march his troops on Rome, and unconstitutionally legalize the mass killing of Marius’ supporters. Marius’ supporters in the senate would unconstitutionally prevent Sulla from fighting a war during one of Sulla’s consulships. Sulla would eventually seize absolute power for himself. Sulla would be the first Roman to be Dictator in almost 150 years. He would also be the first Roman in history to hold the dictatorship without the traditional six month term limit. As dictator, Sulla would illegally change the Roman constitution to make himself and his party (the ultra-conservative republican Optimates) even more powerful. And most importantly, Sulla would set the example (of civil war on Romans, and then the seizing of absolute power) that the future tyrant Gaius Julius Caesar would follow. In the end, the actions taken by key players in the war against Jugurtha would be repeated in the final destruction of the Roman Republic. The future triumvir Pompey would unconstitutionally hold multiple consulships in a short period of time. Crassus, another future triumvir, would illegally bribe politicians to get his way. And the future tyrant Julius Caesar would bribe, unconstitutionally hold the consulship, and become dictator for life (as Sulla had done). It was Caesar’s actions in this regard, as well as the similar actions of his adopted son and heir, Gaius Octavius (later Gaius Julius Caesar Octavianus, the Emperor Augustus) that would once and for all destroy the Roman Republic, and create the Roman Empire. 5. one tangle of shadows. 12. Marius and Jagurtha together. 17. The perfumed cloths shall be absent. 18. A small plebeian procession. 21. Which I take, my not unworthy gift, to Persephone.